Did Russia just declare war on Wall Street and the US Dollar? In Wall Street’s eyes and the central bankers, that is eactly what Russia is doing and has been given the perfect opportunity to say they are doing it defensively. In fact, the Global Research quotes Putin himself, speaking to members of the Upper House of the Duma, the parliament, on March 28. As seen in the videos below, the US and EU were warned relentlessly about how sanctions against Russia could not only backfire but bring the US Dollar one step closer to collapse, yet they decided they needed to talk tough and symbolically punish “one” Russian bank anyway, giving Putin the perfect excuse to dump the Dollar. 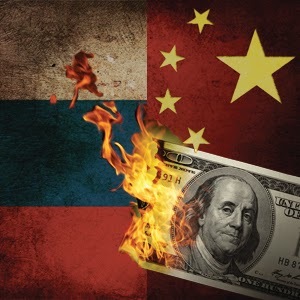 China, New Zealand and others are also making moves to cut the US Dollar out of their currency trades and others will follow as the Dollar becomes weaker, because it is not backed by the gold standard anymore and is being printed up at a rate that has made it basically worthless. The only thing propping up the USD at the moment is that it is the world’s reserve currency and that is what these other countries are trying to change. This latest step by Russia is just another economic shot fired in this financial “war” being waged.